ARE YOU AT LEAST 21 YEARS OLD? Storz & Bickel changed the world of vaporizing by designing the world's most impressive vaporizer - the Volcano, but the German manufacturer has never stopped innovating. So now, you can get performance that rivals that of the best desktop models in completely portable designs: known as the Crafty and Mighty vaporizers. Both models can be used to vape herbs in their standard form, and come with a special pad accessory in the box for use with wax or oil. No matter which of these you choose, you'll be able to experience the full potency and flavor of your materials. These are every bit as fine in quality as many desktop units on the market today, making them the choice of many vapor enthusiasts who truly want the best. Both of these Storz and Bickel models feature a unique convection + conduction heating system. When the vaporizer is switched on, conductive heating is used to begin the flow of vapor immediately to eliminate the need for a lengthy wait. Then, the full convection hot air system allows the vapor to freely circulate through the heating chamber to ensure that material vaporizes completely and flow remains steady. Heat exchangers keep exteriors cool for safe, comfortable handling, and the vapes turn off automatically after 1 minute of inactivity to conserve battery power. Please scroll below to see more detailed information about either of the models. The Mighty is roughly 1 inch larger than the Crafty, making it a little bulkier but allowing it to hold slightly more vaping material. The Mighty also has two batteries to the Crafty's single lithium ion battery, allowing it to function for longer periods of time between charging. The other major difference between the handheld vaporizers is that the Crafty has a free downloadable app that allows a smartphone to work as a remote control. Handmade in Germany, this vape is made for the discriminating vaping enthusiast and offers features you won't find with any other vaporizer on the market today. The Crafty Vaporizer is the smaller of the two and can fit easily into any pocket. Powered by a single lithium-ion battery and has two standard heating settings that are easy to set. With the free mobile app, you can reprogram the heat settings to the precise temperature that you prefer. The Crafty is one of the best vaporizers for anyone who wants the flexibility of being able to vape any type of material! The kit comes with a filling tool that makes it easy to enjoy aromatic herbal blends, plus liquid pads are also included with the kit, making it possible to vape waxy and essential oils. 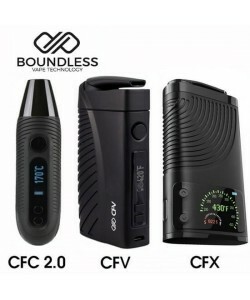 No matter how you prefer to vape, this device is ideal for your needs. The pocket vaporizer features a single button for the convenience of one-touch operation. The first time that you press the button, the chamber will begin to preheat to the preset Basic Temperature of 365 degrees Fahrenheit in roughly 60 to 90 seconds. But if your your materials need a higher temperature, push the button again, and the Crafty will continue to heat up to the preset Booster Temperature of 383 degrees Fahrenheit. When the ideal temperature is reached, the unit will vibrate in your hand, and red light will turn green, signalling that it's ready for use. To maximize the performance of the Crafty Vaporizer by Storz and Bickel, the engineers developed a number of innovative technologies. As mentioned above, unlike other models, the Crafty combines both convection and conduction heating mechanisms. As soon as you turn it on, the conduction mechanism begins to heat the herbs, allowing your vaporization to begin much more rapidly than what is possible with a convection-only heating element. The added hot air convection action ensures that your dry herbs or other concentrates are vaporized evenly and that vapor production is continuous with no dry hits to spoil the experience. Many portable vaporizers heat at lower temperatures than the Crafty Vape in order to ensure comfort and enhance the flavors of herbal blends. Unfortunately, this can hinder the amount of vapor production and reduce the overall quality of the vapor. 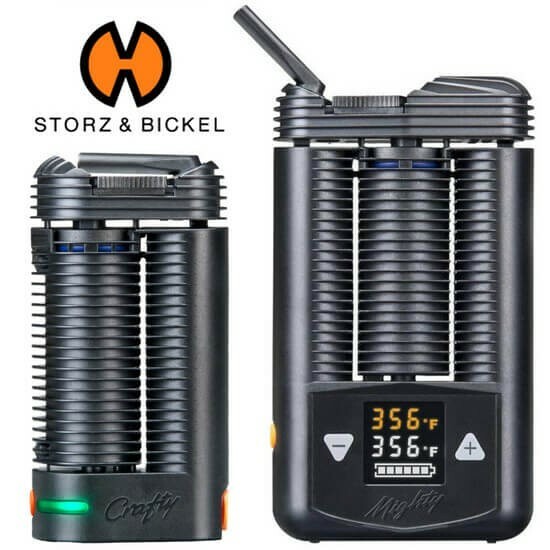 But Storz & Bickel has solved this problem once and for all and built-in a cooling mechanism that makes the vapor the optimal temperature for a comfortable draw and a robust, flavorful taste. At the same time, its superior heating means you'll get plenty of vapor to satisfy your needs. Another feature that sets the Crafty Vaporizer apart from others on the market is its innovative remote control app, which is available as a free download. Once the app is installed on your phone, you can use it as a remote, plus you can also turn the vibration feature on and off or add an alarm to signal when the vaporizer is ready for use. You can even use the app to change the Basic and Booster Temperatures to meet your needs. At 4.3 inches by 2.2 inches by 1.3 inches in size, the Crafty is truly a pocket size. The vape weighs only .28 pounds, making it very easy to carry with you when you're out and about. The compact size also makes it very easy to store in your home. Powering it is a high quality lithium ion battery that is rechargeable via USB cable or wall adapter, both of which are included in the box. A car adapter can be purchased separately to allow you to recharge the battery with the lighter in your vehicle. When you charge the multi-function herbal vaporizer, a blue light will illuminate and flash rapidly. As the battery becomes more and more charged, the speed of the flashing will decrease. The light will then glow a steady blue when the battery is fully charged. If you choose to recharge with the wall adapter, you can take advantage of the pass-through technology and vape while the unit is still charging. But if the battery life is 0%, you will have to first charge it to at least 20-25% to start vaping while plugged in. Backed by a 2-year limited warranty from the manufacturer, the Crafty Vaporizer comes with everything that you need to get started vaping on the go. You'll also receive three replacement screens, a cleaning brush and a herb grinder. Replacement parts and additional accessories can be purchased separately at a later date and are always available. With the demand for efficient, well constructed vapes on the rise, Storz and Bickel have responded with the creation of the Mighty, one of the best on the market for many years. As expected, Mighty Vaporizer continues the brand's tradition of creating best vaporizers. Crafted in Germany, using only best materials. The Mighty is larger than the Crafty and runs on two lithium-ion batteries, allowing it to be used longer before it requires recharging. With this model, you get the benefits of an LCD display screen that makes it possible to set the exact temperature you desire and to see the current temperature within the heating chamber. The Mighty Vaporizer by Storz and Bickel continues the brand's tradition of creating vaporizers of the absolute finest quality. It is meticulously crafted in Germany, using the absolute best materials. Warrantied for 2 years, the device produces large amounts of pure, clean vapor with every use and is durable and resistant to wear and tear. If you like to switch between different types of materials, the Mighty is sure to meet your needs, as it can be used as a dry herb, wax or oil vape with the included liquid pads. No matter what you're vaping, you'll get the absolute best quality possible due to the innovative design and impressive German craftsmanship. As soon as you turn it on, the conduction heating element goes to work, allowing you to begin vaping as soon as the device finishes pre-heating. Then, a full convection system distributes hot air through the materials in the heating chamber. This ensures that your dry herbs, waxy concentrates, essential oils vaporize completely and that the vapor flow is continuous and steady with every use. The dual heat mechanism means you can begin to vape within 60 seconds and will never have to worry about wasting any of the material. Storz and Bickel has designed the Mighty to give you the flexibility to set it at the ideal heat level for optimal performance. The adjustable temperature controls will allow you to set the temperature level between 104 degrees Fahrenheit and 410 degrees Fahrenheit (40 degrees Celsius to 210 degrees Celsius). Setting the temperature is as easy as pushing the up and down arrows on the front of the handheld. You can also easily change between Fahrenheit and Celsius temperature readings to ensure ease of use. Many similar competing models grow uncomfortably hot the longer you vape, making it difficult to truly enjoy the experience. Engineers at Storz & Bickel have designed the Mighty Vape to eliminate this problem. Just like in the Crafty, a heat exchanger is used to transfer hot air to the outside of the unit, so that there is no risk of combustion and your fingers stay cool. Plus, the heat exchanger keeps the vapor cool for a pleasing experience. It also has an ingenious design that makes the Mighty very easy to take with you wherever you go. 5.5 inches by 3.2 inches by 1.2 inches in size and weighting just 0.5 pounds, makes it a very lightweight and compact vaporizer. Plus, the straw mouthpiece folds away when not in use to further decrease the size. You'll never have to wonder how your Mighty Vaporizer is set, thanks to its large LED display. Very easy to see, the display shows you both the actual temperature inside of the heating chamber and the temperature to which you have set the device to heat. For added convenience, it vibrates when it reaches working temperature. The LED display also has a battery life indicator, so when you see six bars inside of the battery icon, means that this Storz and Bickel vaporizer is fully charged and ready for use. But when the battery icon is completely empty, you'll need to recharge the device. The Mighty includes not just one but two lithium ion batteries, allowing it to run for much longer than most similar size vapes. The all-in-one vaporizer includes a wall adapter for convenient recharging, and you can even vape while the device is plugged in due to the use of pass-through technology. To conserve the life of the batteries, it has a 1-minute automatic shutoff feature. As you vape, you can push a button to reset the shutoff and keep the device on for an additional minute. Made for easy cleaning, the Mighty Vaporizer requires only basic maintenance to continue to function at its best. With the kit, you'll receive a cleaning brush to ensure ease of care and three replacement screens for your convenience. With the purchase of the Mighty kit, you will get many accessories included in the box. A filling chamber tool to make loading incredibly easy, and when not in use, the tool stores away inside of the bottom of the vape for easy carrying. 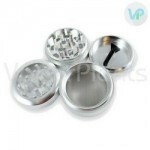 You'll also receive a larger filling aid and an herb grinder with your purchase. Exceeded my expectations - Review by Patricia O. The reviews are mixed but I decided to take a risk and get the Crafty Vaporizer anyway. This vape totally exceeded my expectations and I recommend it to anyone who really needs a powerful vape that can keep up with a heavy user. Crafty charges fast - Review by Brad O.
I love the Crafty battery life--it is decent and stays on for around 45 minutes at a time. When it needs charged, it does not take long at all. Mighty is built well - Review by Mildred J.
I got my Mighty a few weeks ago and love that it is able to stand up to my heavy usage habits. The company has a wonderful reputation of creating top notch vapes and I believe every word of the hype after using this. It produces excellent vapor, a great taste and is easy to use. The filling tool that comes with the Mighty makes it easy to change the herbs. They heat up really fast and never burn. The vapor even comes out really cool from the Mighty which is surprising as it can go to such high temperatures. It also seems to be built well even though it is made out of plastic. Heats quickly - Review by Julie J. Crafty is able to heat up in a very short amount of time and heats the material efficiently. Good vape - Review by Rosalie J. The battery power is a bit low but otherwise Crafty is a really great portable vaporizer. Outshines others - Review by Marjorie J.
I own a number of different vaporizers, all of which are excellent quality, but I keep coming back to the Crafty Vaporizer by Storz & Bickel. This vaporizer outshines all of the many in my collection and makes it hard to stay away from. Great design - Review by Marie J.
I love the design, which I can tell is totally focused on its functionality. Delicious clouds - Review by Patricia S.
The clouds that come out of the Crafty Vaporizer are large and cool, while the vapor itself is tasty, heady and does not burn my throat at all. Mighty Vaporizer is excellent - Review by Kesha P.
Overall, the Mighty Vaporizer is an excellent portable vaporizer for daily use. Comfortable cool vapor - Review by Kelly M.
The Crafty Vape has a comfortable draw resistance that feels like a natural breath in through the mouthpiece with every hit. Control for my phone - Review by Edward C.
I love the fact that the Crafty Vaporizer comes with an app for my phone from which I can control it. Simple - Review by Kevin E.
Crafty is simple to set up and clean up with the included cleaning tools. No combustion - Review by Ruby E.
I don't think that Mighty Vaporizer has once caused combustion which is hard to find in a vaporizer of this size, especially. Low maintenance - Review by Mary D.
Crafty is really easy to clean and to maintain over time, and I know that the Crafty Vaporizer is one that is going to be with me for life. Buy this vaporizer - Review by Tanya G.
I think the Mighty is worth every single penny that I have spent on it and I would definitely buy this vaporizer again if I had to. Great vaporizer - Review by James M.
The Crafty Vaporizer is a great portable vaporizer but because of its size I would recommend that you use it at home opposed to taking it with you on the go. Super long battery life - Review by Lorene C.
Mighty is really reliable and has a super long battery life that I am in love with; I have never experienced the Mighty vape dying on me in the middle of a session. Not disappointed - Review by Jose C.
I decided to take the plunge and get the Mighty for myself and I can happily say I have not been disappointed. 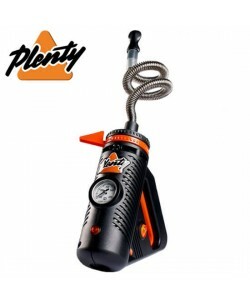 Pleasant - Review by Sammie J.
I was pleasantly surprised with how well Mighty works and how little effort it takes to maintain it as it is so easy to clean regularly. Top quality vaporizer - Review by Ronald S.
I own a number of different top quality vaporizers that I love to death, but the Crafty Vaporizer really takes the cake. It has a decent battery life but it rips like a champ and leaves me feeling satisfied. This vaporizer comes with the ability to heat up very swiftly and is great for those who want an on the go toke with its body that is easy to conceal. I think that is works just as well as my desktop vaporizer by Storz & Bickel, too, which is really saying something if you have ever used one of their tabletop vapes. Super fast - Review by Emily G.
Crafty vape by Storz & Bickel heats up super fast to provide me with a vape whenever I want it. Easy to clean - Review by Ashley C.
The Crafty Vaporizer by Storz & Bickel is one that truly stands above the rest and is super easy to clean. Doesn't burn herbs - Review by Athena A.
I love the Mighty flavor. It gives me every bit of the flavor profile that I expect without burning my material. Powerful - Review by Kerry A. The Mighty is a powerful vaporizer that is everything it is cracked up to be. A bit hot - Review by Bonnie A. The only thing that I will say about the negative points of the Mighty is that it gets a bit hot to hold sometimes. Reminiscent of a desktop vaporizer - Review by Delmer M.
The Mighty vaporizer is a really solid vape that feels durably made and great in the hand even though it is made out of plastic. It is reminiscent of a desktop vaporizer in the way that it hits which is really impressive. 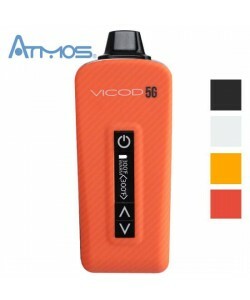 It is technically a portable vaporizer but it is not really great for taking out in public due to its larger size. That said, if you want the power of a desktop vaporizer with all of the comfort of a desktop vaporizer as well as the efficiency while being able to move around while you use it, the Mighty Vaporizer might be for you. It heats up very quickly and lets me vape it whenever I want for that reason. Vapor is cool - Review by Jeffrey T.
The Crafty vapor is cool and smooth and does not irritate my throat like a lot of other vaporizers do. Smooth and flavorful - Review by Omar E.
The Crafty vapor is smooth and flavorful and provides me with a great smelling aroma. Because it is aromatic and larger, I would not say this is a good vape for taking with you on an outdoor excursion. It is more for indoor use. Bluetooth app - Review by Desmond N.
The Storz & Bickel app itself makes it really easy to clean as well. All time favorite - Review by Stella D.
As someone who owns a number of high-end portable vaporizers, the Crafty Vaporizer is my all time favorite. This vaporizer rips like crazy and is one that provides excellent cloud production. This is often hard to find in a portable vaporize that typically only gives off thin wisps of vapor at a time. Large clouds - Review by Waylon R.
The Mighty Vaporizer clouds are large and potent without giving off too much of a smell, I don't think. Durable - Review by Tommy M.
I love the Mighty Vaporizer because it is a durable vaporizer that works as well as it is advertised. Great - Review by Jacob N.
The Mighty Vaporizer is an overall great vaporizer. Wonderful - Review by Camille J. Overall Crafty is a wonderful vape. High quality and portability - Review by Norman B. Mighty vaporizer is hands down the best one that I have ever used in terms of vapor quality and portability. It is a bit big, so I do not recommend taking it out in public unless you live in a place where medical or recreational marijuana has already been legalized. Quick - Review by Laura J. Mighty has a quick heat up time so that I can vape it essentially at a moment's notice. Really high temperatures - Review by Daisy A. Mighty vaporizer has really great battery life that is super powerful and can get the vape up to really high temperatures. Impressive - Review by Annabelle S.
The app that comes with the Crafty Vaporizer is really impressive and lets me control everything to a T making it a simpler process for me. Favorite vape - Review by Myrtle D.
The Crafty Vaporizer is my new favorite portable vaporizer. It lets me vape at home or out in public in a comfortable way. Works really well - Review by Aurora J. Crafty is durably made and works really well with the app that comes with it. Best portable vaporize - Review by Kelsey C.
Using the Crafty Vaporizer has been the best experience I have ever had with a portable vaporizer. The battery life might be a bit low, but if you do not let it get unreasonably low you can charge the Crafty Vaporizer while you are using it. It plugs in like a normal vape and can be used with a number of attachments such as the water pipe. Short battery life - Review by Thomas M.
The only downside that I see about the Crafty Vaporizer is its less than satisfactory battery life, but that's really okay because it only takes a little bit of time for the Crafty Vaporizer to reach its full charge. Very impressed with the performance - Review by Charles N.
I am very impressed with the performance of the Mighty. It is able to work beautifully with both herbs and concentrates alike. I have only had this vaporizer for one month but I have not had any problems nor have I had any issues with the performance dropping over time like a lot of other vaporizers. It feels really great in the hand and feels super well made even if this Mighty vaporizer is made out of plastic. Less discreet - Review by Rebecca R.
Mighty vape is heavier than many portable vaporizers and is also less discreet, so if you are looking for something stealthy for use outside, this one might not be for you. 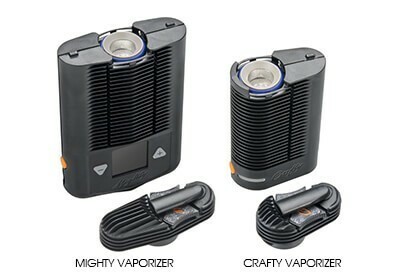 However, if you want a portable vaporizer for at home use, look no further than the Mighty vaporizer. Andrew M. - Review by Weed K.
I have owned a lot of vaporizers before but none of them compare to the Mighty. Short automatic shutoff - Review by Angela R.
The only complaint that I have is that the Mighty has an automatic shutoff that is too short for my liking at one minute and the price. Portable yes, but I won’t be able to fit this in my pocket. Good battery power thanks to its automatic turnoff option which bugged me at first. After suing it for over a month I found no issues - really cool vapors , super easy to clean as the chamber is usually clean. Bottom line, expensive but WELL worth it! I went back and forth between Mighty and Crafty to order this one in the end only because it’s easier to conceal. Premium quality, expected from Storz & Bickel, and one of the best, if not the best, vaporizers out there. The filling tool is kinda cool and each chamber lasts me around 10-11 10 second draws. I know most people prefer to invest less in their portable vaporizer, but this one is one of the best out there! The clouds quality can easily compete with my Volcano, it went way above my expectations. This vaporizer heats up In less than 90 seconds and is super easy to fill the chamber with dry herbs. It seems to hold around 0.3 grams of herbs inside the chamber, with the help of a grinder. I love the crafty. There's really nothing quite like it. Amazing vapor, very good flavor, very simple to use, solid design. My only complaint, as you may have predicted, is the battery life. I do wish I could get more sessions out of each charge. But that's why they made the mighty right? Great company with some great products! My brother got himself Crafty Vaporizer and we loved using it, one he moved out I got myself the upgraded version, the Mighty Vaporizer, and I truly stand by this product. Not only that I have been getting getting great customer service from vaporplants staff, I am also being able to get great service from Storez and Bickel, the manufacturer of this awesome device. Comes with all of the needed accessories, there is no time that needs to be wasted on setting it up as it is very easy and self explanatory. If you can afford it, definitely get either Crafty or Mighty, they are worth the price tag! 140 58th St, Brooklyn N.Y.
© 2003-2018 VaporPlants.com online store. All Rights Reserved.